Detailed review of Suave Dry Shampoo Spray. See what real experts and actual users have to say about this dry shampoo. Suave Dry Shampoo Spray was one of the best inexpensive dry shampoos I’ve tried. When I first applied the product to my hair, I didn’t know if it would blend well because of how fast it came out and how white it looked on my hair. After I gave the product a few minutes to settle and I brushed it through my hair and into my roots, it proved me wrong by blending perfectly and absorbing the oil so well. It gave me great added texture and volume and even kind of helped with styling my hair. Two of the downsides to this product were the very strong smell that lasted all day and that it made my hair look and feel dry. Besides those minor negatives, I really liked Suave Dry Shampoo Spray and I also really like how inexpensive it is. Overall, Suave Dry Shampoo Spray worked very well to absorb the oil in my hair and improve the texture and body. Suave Dry Shampoo Spray looks and feels thick when it is first sprayed onto the hair. The spray has a stark white pigment to the powder and it sprays on very heavily. At first I thought the product was going to be too thick and too pigmented, but after I let it settle, it ended up being perfect. 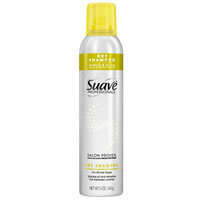 Suave Dry Shampoo Spray was easy to apply with the aerosol can. The product applied evenly and came out very fast onto my hair. Once the product was applied into my hair, it was very easy to use. After I applied the amount I wanted, I brushed the product through my hair and worked it into the roots, and it looked awesome. I was very happy with the way the pigment covered and absorbed my oil and didn’t sit on top of my hair. The product comes out just a bit damp and then dries in about 15 seconds. Suave Dry Shampoo Spray smells floral and is very strong. The smell is good but is overpowering, and be prepared for it to last in your hair all day. The results I got from Suave Dry Shampoo Spray were great. 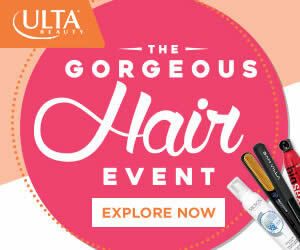 The product gave my hair a lot of added volume and texture. The only thing I didn’t like very much was that it made my hair look and feel dry. Suave Dry Shampoo Spray lasted almost all day long. I got a good 9 hours of oil free hair. Toward the end of the day, I did find myself touching up the roots before I went out to dinner because a bit of the dirty hair was coming through. Overall though, it did a really great job fighting the oil. Suave Dry Shampoo Spray costs $9.97 for 5 oz. of product. That comes out to $1.99 which is in expensive and totally worth it for the product you are getting. Unfortunately, I couldn’t find a money-back guarantee for Suave Dry Shampoo Spray. To buy Suave Dry Shampoo Spray, Click Here. Price Costs $9.97 for 5 oz. which comes out to $1.99 per oz… very reasonable!